Today is the last day of the NaBloPoMo challenge to blog each day of November. I have made it to November 30th and I can see myself breaking the tape at the finish line. I set a goal, I rose to the challenge and I succeeded! My feeling of accomplishment inspired me to consider today the other ways in which I feel full. My stomach feels warm and full after a dinner of slow cooker Turkey ala King, made with leftover turkey from my experiment to cook a whole turkey in my crock pot. Surrounding me are my pets, the warm and fuzzy children who bring unconditional love to my life each and every day. I am full of furry love. Next to me sits my husband, my best friend and partner. He allowed me to rest in the bedroom today while he took care of interacting with the plumber who came to fix the bathroom sink. I am full of gratitude for his love, understanding and help. I am also full of happiness that the sink is fix without having to tear up the wall to get to the pipes. I am also happy that the cost was below the repair estimate. I am full of relief that the email I sent Cyndie yesterday was received with the intention I wished to convey. I am concerned about the brake light indicator which has been illuminated on Cyndie's dashboard. I wrote and told her how worried that light made me feel and encouraged her to take her car in for a least a consultation with her mechanic. When I spoke with her a few hours ago, Cyndie thanked me for the email and told me of her plans to go to the repair shop tomorrow. Cyndie went back to work today, three weeks after her health scare and emergency surgery earlier in the month. I am full of thanksgiving that everything turned out well. Robert helped me move our newest furry child, Sir Hiss, into the house today. I am full of hope and anticipation as I see my efforts to offer this little kitten a new indoor life come to fruition. I continue to be full of hopes and dreams about forging on with my aspirations to make writing a fibro-friendly second (or is it third?) career. Completing another month of daily blogging helps me feel like I am taking small steps toward accomplishing this goal every day. In what ways do you feel full? Share your story by adding a comment below. Over the weekend I took my first steps moving beyond the virtual world of Facebook to the real world and old technology of the telephone. One of my friends from grade school that I have reconnected with on Facebook has experience with feral cats and graciously offered to coach me by phone. We discussed how Sir Hiss came to be a part of my life and what small steps I have been taking to introduce him and get him accustomed to the indoor life. She validated my efforts with Sir Hiss. She said I seem have good instincts when it come to taming "wild kittens." (Sir Hiss really isn't that wild; I'm taking some creative license and embellishing a bit here.) She also filled in some of my knowledge gaps about the process and gave me a clear plan to follow to continue this process. It seems there were some inaccuracies in the information I read online and apparently what I read doesn't really apply to a kitten of Sir Hiss's age, which we think is around 6 months. This was the validation I was hoping to receive. After spending time talking about Hiss, we spent a little time catching up on family and life. She reads my blog on a daily basis and mentioned one of the posts I wrote about my mother. She explained to me, "After reading that post about your mother, it helped me understand her strange expression when I saw her." Now this was an unexpected validation! I always thought that my classmates and friends were unable to see how un-motherly my mother was towards me and my siblings. I used to tell them about the unpleasant things my mother would do, hoping that my honest friendship with them would be enough to convince them that I was telling the truth. In my eyes, my mother was akin to Dr. Jekyll and Mr. Hyde, behaving perfectly appropriate in public and perfectly horribly in private. It is a terrible thing to spend your childhood living with a parent who does not want to be a parent and let's you know this in her words and actions on a daily basis. It feels isolating and lonely thinking that other people can't see what is happening in your home. The second validation meant so much to me. Her validation surprised me with an unexpected gift, which was better than any present she could have bought me at a Black Friday sale. 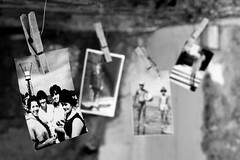 Knowing that she has a photographic memory, I trust that she truly remembers things the way they were. Thanks for the validation my friend! I talked to Cyndie again today and she is gearing up for her return to work on Monday. I can hardly believe it has been almost three weeks since her visit to the Emergency Room and subsequent hospitalization and emergency surgery for a congenital diaphragmatic hernia. Today Cyndie volunteered in Burbank, helping with the preparations for a Rose Bowl float. She got to make dirt out of dried magnolia leaves. Now my sister Cyndie tends to call me around dinner time, a fact we have discussed and laughed about several times since she has been off work after her surgery. So when I told her I needed to go to eat dinner, she asked me what I was eating. I replied I was continuing to enjoy leftover turkey from Thanksgiving. Which prompted a conversation about how I made my Thanksgiving turkey this year. Since I have rediscovered my crock pot slow cooker this Fall, I have been having fun trying new recipes. I got to wondering if you could make a whole turkey in a crock pot. After all, there are recipes for making a whole chicken in a slow cooker. So I took a trip on the Internet and found this fantastic post: CrockPot Whole Turkey Recipe at the blog A Year Of Slowcooking. This recipe uses the The Diestel Petite Turkey, "the perfect everyday turkey." I was able to find a 8.33 pound one at my local Whole Foods in the refrigerated case. I followed the recipe almost exactly as written, but I found that my turkey didn't quite reach 140 degrees on my meat thermometer at 3 hours. I was worried, but put the lid back on and let it cook for another 3 hours. The only addition I made was to insert a pop up thermometer into the thickest part of the breast. It was a good addition, because it let me know that at the six hour point my bird was done. I pulled out my meat thermometer once again and my bird registered 180 degrees. It worked! The turkey was moist and delicious and loaded with my favorite, dark meat. It's a real treat eating all the leftovers. Plus there was a generous amount of turkey juices at the bottom of the crock that made the base for some full-flavored turkey gravy. I plan to repeat this recipe many more times. 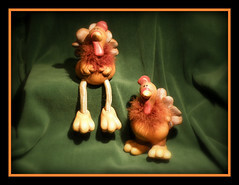 I am hoping that I can find The Diestel Petite Turkey closer to the 6 pound size for next time. I strongly suggest you use the pop up thermometer as well so you don't have to lift the lid to check the temperature, which increases cooking time when you release the steam. I am posting this recipe for my sister Cyndie so she can try this recipe too. Enjoy Cyndie and leave me a comment to let me know how your bird turns out. That's goes for anyone else reading this post too. I am so fatigued right now, prostrated really. Thanksgiving took a lot out of me with all the preparing and cooking. Now I have tons of leftovers, not a bad thing because I love eating leftovers, especially dark meat turkey. Leftovers give me a planned break from cooking for several days, which hopefully will give me the time I need to recover from choosing to be outside my energy envelope for a day. So it's all rest for me--absolutely no Black Friday Christmas shopping for me. By the way, if you are so inclined, consider supporting Oh My Aches and Pains! this holiday season when you head to Amazon.com for your holiday shopping. Just click the link below and a small percentage of your purchase goes to support my blogging efforts. Don't forget to bookmark this link so all your shopping at Amazon.com can support Oh My Aches and Pains! I'd be very thankful if you would bookmark my Amazon Associates link! Today is Thanksgiving Day here in the United States, which is my favorite holiday. Besides spending time today preparing a harvest feast and enjoying the pleasure of eating, today is a day when I spend some time counting my blessings. For the purposes of this blog post, I am going to limit myself to sharing with you my top ten. My husband, who continues to be at my side ... for better or for worse, for richer or for poorer, in sickness and in health. My friends who are like family and my family who are like friends. My furry children, including our newest addition Sir Hiss. We got news yesterday when we took Sir Hiss to the vet that he is FIV and FeLV free. This means he can be added to our brood. All the self-help strategies that make living with chronic illness more manageable. All the tips, tricks and assistive technologies that make life fibro-friendly. All the caring and compassionate medical professionals that help me manage my multiple health problems in ways that empower and support me. All the advantages afforded me because I live in the age of technological and scientific advancement. I know that if I had been born in 1865 instead of 1965 I would not be here today to enjoy another Thanksgiving celebration. Contentment. I have finally reached a point in my life where I feel comfortable being the person I am. To paraphrase Madonna, "It only took me 40 some odd years to get it right!" My new found pursuits of daily blogging and writing a novel. Thank you Cyndie, NaBloPoMo and NaNoWriMo! Faith, hope and love. Hope makes life worth living, faith makes all things possible and love makes the world go 'round. Happy Thanksgiving! May you relish your blessings and share your gratitude with the people and pets that make your life special. Yesterday I had an appointment with my endocrinologist Dr. Anne Peters. I really like Dr. Peters. More than anything, she gets how my body is complicated and unusual. She isn't discouraged when I react strangely to medications. She sees it as an opportunity to think "outside the box" and try a new medication or an old one in an unconventional way. She isn't skeptical when I tell her I think my problems managing my blood sugar are related to my chronic Hepatitis C infection. She is actually one of the few doctors I see that absolutely agrees with me that my Type 2 diabetes and my chronic Hepatitis C infection intertwine, intersect and interfere with each other. Another ritual I enjoy as part of my appointments with her is getting a copy of my lab results. There is something about seeing the actual numbers on paper that is important to me. Yesterday I got to see that taking 1,000 IUs of Vitamin D a day has finally raised my Vitamin D level into the normal range. I saw that my A1C, the measure of my glucose control over three months, is 7.2, which is OK ... I want it to be in the 6. * range, but this is easier said than done. Then I saw my Hepatitis C viral load. I admit I wasn't so much shocked as amazed. My Hep C viral load has been as high as 10 million in the past few years, however it has been some time since a Hep C viral load has been ordered as part of my blood work. I have been told that my Hep C viral load doesn't mean anything unless I am undergoing Hep C treatment. During treatment the viral load is used to measure efficacy: if the viral load goes down, then treatment is working. Right now I am living with 9,450,000 International Units (IUs) of Hepatitis C in one milliliter (mL) of my blood. An IU is equivalent to 2.7 viral copies per mL, so I have 25,758,000 copies of Hepatitis C per one mL of my blood. My body holds about 4.5 liters of blood, so some quick math (check my calculations please!) and I discover have a mind-blogging 115,911,000,000 copies of Hep C in my blood stream. That doesn't even take into account all the virus hiding in my liver. I am in awe. Hep C has turned me into a virus-making machine. I am wondering what all that virus is doing to me. That's 115 billion and me living in the same space, my body. Isn't it getting a little crowded in here? Every day, I spend some time trying to tame our wild kitten, Sir Hiss. I feel a bit frustrated and worried about the whole undertaking. I have no experience, have found little information on the Internet, have not been able to talk to a real, live person to trade tips and tricks about the process and I am left wondering if I have done the right thing by trapping him in the first place. Part of the taming process involves spending time with Sir Hiss. Considering that we really haven't gotten to the holding and petting phase, this time is more about hanging out and staring at each other. But since I am not really supposed to be staring at him, I migrate over to the book shelf, take out a book, sit down and spend some time reading while the kitten stares at me. This is how I've discovered my copy of The Mitral Valve Prolapse Syndrome/Dysautonomia Survival Guide over the past few days. I admit I have been mostly skimming it, but today I made a discovery which lead to a revelation. In a nutshell, I learned the importance of using the right words to describe the symptoms of my chronic illnesses. I say I have chronic fatigue syndrome. I also say a lot in conversation that I am tired. The truth is that I am not tired, I am fatigued. Fatigue is a constant deficit of energy that makes it impossible for me to get as much done in one day as a normal person can. In order to complete the number of tasks, chores, errands and other activities a normal person can accomplish in one day, I need several days to a week and sometimes even more time. I am currently plagued by a decreased capacity to function normally due to dysfunction of my central nervous system. My energy fuel tank leaks and the level is always hovering near empty. It is important to make the distinction between tired and fatigued. I can not tell you how many times I hear other people say, "I get tired too." when I say I am tired. After my revelation, I agree, normal people get tired. Normal people get tired when the exert themselves, whether physically or mentally. I am fatigued even when I am resting. 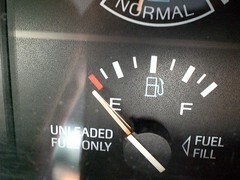 Normal people start their days with an energy fuel tank that is closer to full than empty. Normal people don't wake up tired; I envy them because they wake up rested, refreshed and ready to tackle their day. Normal people bounce back from being tired to being energetic once again. They just don't have a constant energy deficit like me. Beyond commonly used words, I think prostration is a better word for my symptom of chronic fatigue. Extreme exhaustion or lack of energy is the definition of prostration. Lying face down on the ground out of reverence or deference to someone or something is a more commonly referenced definition of prostration. Which is apt, since I often feel like I am flat out wiped out and can barely resist the urge to just fall flat on my face and succumb to the forces of gravity. My preferred positions are reclining and lying down. That is how fatigued I am now. 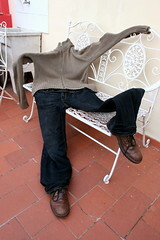 Even when tired, I don't think normal people have to fight to remain upright against the forces of gravity. I talked to Cyndie yesterday and finally gave her the recipe below for what I call Thanksgiving in a Crock. As for Cyndie, she is doing much better now that she is two weeks post abdominal surgery for a diaphragmatic hernia. One more week and she'll be back to work. She has a lot to be thankful for this Thanksgiving! We actually ate this meal on Halloween night, after handing out candy to trick-or-treaters all evening. Back then, Cyndie's plans for Thanksgiving were to spend a long weekend in Las Vegas, so we celebrated an early Thanksgiving together. Now post-surgery, her plans for the next week are to continue to gently ease back into her normal routine, wait for her disability check to arrive and stay close to home. Hence the recipe exchange that happened over the phone yesterday evening. As for our Thanksgiving Day plans, Robert and I will be sharing the day together at home. When we got engaged, Thanksgiving was the holiday designated to be shared with my family. But after my mother's death in 1999 and my father's decline from Alzheimer's disease and eventual death in 2004, Thanksgiving has become the 'on-our-own' holiday. Over the past few years, we tried going out to eat and ordering heat and eat meals, but they will never come close to my memories of Thanksgivings spent at my Grandma Devine's home. My chronic illnesses make it impossible to attempt cooking the traditional meal at home, even if I try to do it over several days. But this recipe provides all the comforts of a Thanksgiving meal in an easy-to-prepare fashion. I have to say that the results were surprisingly good too. 1. Combine the stuffing mix, chicken broth and butter in a microwave-safe bowl. Cover and cook on HIGH for 5 minutes. Remove and set aside to cool. 2. 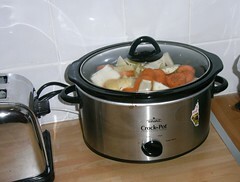 Place green beans, onions (and carrots) on the bottom of a 5 quart crock pot. 3. Mix pepper, salt and poultry seasoning in a small bowl and rub turkey breast with the mixture. Insert the pop-up thermometer into the thickest part of the breast. Place on top of the vegetables and surround the turkey with the sweet potatoes or potatoes. 4. Mix together mushroom soup, wine and gravy mix in a large bowl. Pour over the turkey and potatoes. Spoon stuffing around the turkey, on top of the potatoes. 5. Cover and cook on LOW. Cooking time will vary depending on the weight of the turkey breast you select and can range from 4 hours to 6 hours. It is crucial that you use the pop-up turkey thermometer, as lifting the lid to check the temperature of the turkey breast will disrupt the cooking process. 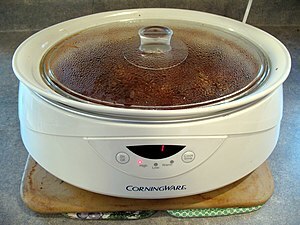 If the meal is done early, simply switch the crock pot to KEEP WARM until you are ready to serve. This recipe feeds 6 people. Consider purchasing extra stuffing mix to serve with any leftovers. This recipe yields the equivalent of a green bean casserole, gravy covered potatoes, stuffing and super moist white meat turkey all in one pot. Yum! Robert and I just signed up for Netflix and watched our first DVD tonight. We watched the animated film Up and we really loved it. The surprising thing about the movie was how one of the story lines in it seemed to mirror our own relationship. Robert and I could be a real life Carl and Ellie Fredricksen! If you can't see the embedded YouTube video above, follow this link to YouTube to watch it there. I promise that it doesn't give away too much of the movie if you watch this short clip. In fact, it might make you want to run out and rent the movie yourself. I should warn you that the parts of the movie that reference Carl's and Ellie's relationship really brought tears to my eyes! I think everyone wants to have a relationship like this in their lives and it is wonderful that this warm, funny and touching story line is part of this children's movie. It's cheesy, I know, but I give Up two thumbs up! I am not paranoid, I swear, yet sometime I think our house is conspiring against us. 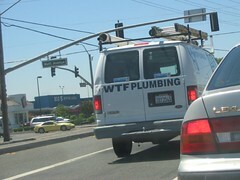 Lately it's been problems with the plumbing, more specifically the drains. First the kitchen sink drain backed up. After drain cleaner, plunging and swearing, we called the plumber, paid $60 and the problem was temporarily fixed. Now, several weeks later, it's the bathroom sink. We again have tried drain cleaner and plunging with no success. I guess it's time to call the plumber again. Our house was built in 1949. I guess a lot of things have changed since then, including what materials are now used for plumbing. After I bought the house in 1994, I paid to have the incoming water pipes re-piped from galvanized steel to copper. Now the plumber tells me that the drain pipes need to be replaced too. I guess they are made from the same material, galvanized steel, which rusts and can leak over time. A quick Google search tells me that PVC is now the pipe of choice for drains. With a house that is sixty years old, repairs probably should be a surprise. I just question the timing. More often than not, house problems rear their ugly heads when we least expect them, when they are the most inconvenient and when we can least afford them. I wish my house understood that I do want to upgrade it and make everything work better. If Robert and I were still DINKs--dual income, no kids--this might have been accomplished by now. But since I am disabled and my income is now Social Security Disability, reaching this goal is much harder to attain. Funny how a clogged drain has gotten me in touch with the crappier aspects of living with chronic illness today. I'm not so much feeling sorry for myself as acknowledging that sometimes reality bites. Make no mistake, if I could chose, I would not chose a life with chronic, disabling illnesses. I much preferred my previous life as an independent, self-sufficient, get-things-done career woman. Anyone who thinks otherwise of me just doesn't understand how chronic illness has completely changed my life. Wish me luck getting the drain unclogged. As for my feelings, well, tomorrow is another day. Just because I feel this way today doesn't mean I'll wake up feeling this way tomorrow. I know that allowing myself to experience my feelings ensures my emotional drain doesn't get clogged. expect more from universal supply. "...you need to be paying attention to see the clues that lead you to ... universal supply. I think most of our discoveries are just moments when we happen to be paying attention to the "here and now." Which I guess makes living in the "here and now" always the "right place at the right time." So I have been trying to follow my own advice and pay more attention to the things that the universe is offering me, something akin to "picking up my orders from universal supply." One problem that I have been trying to solve is preventing the kitten from spilling his food and water everyday. Here is the kitten, Sir Hiss. Isn't he cute? Sir Hiss was born to a feral cat mom and Robert and I are attempting to tame him so we can invite him into the house to live with us. This is going to take some time. So in the meantime, Sir Hiss lives in a crate, complete with food, water and litter box, in the bonus room off our garage. In the picture above he is sitting on a tee pee cat bed, squashing the tee pee part. It is a good thing he is so cute and I am programed to respond to cuteness, because this little guy is a lot of work! Everyday, I visit him several times. It seemed like every time I visited him, I kept finding dry food scattered all over the crate and water spilled onto his toys and the tee pee. Which meant more work for me as I was the one to clean up the crate and launder the wet toys and tee pee. Needless to say, I was getting tired of doing this every day, sometimes twice a day. I put the bowls into Ziploc containers and filled the space between the bowls and the containers with rocks from my garden. So no trip to the store needed, I had all the materials at home already and kitten hasn't spilled food or drenched everything with water since I implemented my version of heavy pet bowls. So thanks to "universal supply," I got an inspiration, used some items in an unusual way and solved this problem. So when I saw all these commercials on TV advertising for the Christmas/Hanukkah/Kwanza/etc. holiday season today, I had to stop and remind myself that Thanksgiving was next week. The early arrival of these commercials had me really confused for a moment, and feeling sad and disappointed too. Thanksgiving has been my favorite holiday since I completed my cancer treatment back in August 1988. It seems a shame that it has become less important than the big Christmas shopping season. But then again, the act of thanksgiving is a more of a learned behavior. I didn't become a fan until surviving cancer drove home how important it was for me to count my blessings and say a huge thank you to whatever divine entity was responsible for my creation and cancer survival. In contrast to Christmas, it seems no one has to teach us to want (beg, plead, coerce, blackmail, steal) presents. No, for a true thanksgiving to happen, it seems someone or something must teach us how to be grateful. Each year I reflect on how fortunate I am that my teacher, cancer, didn't end my thanksgivings 21 years ago. So please, let's get these holidays back in the order they belong. The Halloween decor should not have to share space with Christmas decorations, although the juxtaposition of the celebration of the birth of Jesus and gory, gruesome death is thought provoking. Yes, I love listening to Christmas music, but not when I am at the grocery store shopping for my Thanksgiving turkey. I know all the retailers and economists want this to be a successful holiday season, so perhaps to ensure this they should take a moment to be grateful for their blessings around their Thanksgiving tables before plunging all of us into the insanity and madness that is Christmas shopping. As for me, I will once again count my blessings and focus on gratitude on Thanksgiving Day. My thoughts won't turn to Christmas until the following day. Then I'll do my best to support the economy by shopping fibro-friendly ways: online and early. Yesterday I watched the afternoon news, something I rarely do. I've given up on watching the TV news because my brain has lost some of its ability to manage intense stimuli due to fibromyalgia. For me, the news is all about sensationalized tragedy and over-the-top stories about everything that is wrong with the world. I don't need all that negativity in my life, so I don't watch the news anymore. 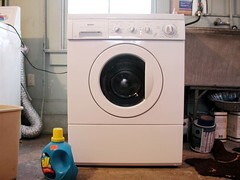 "Consumers with front loading washers are complaining about a smell coming from their machines," the female newscaster started. Just great, I thought, they are going to explain why my wash machine is smelly and I am sitting here otherwise occupied! Fortunately, like many TV news stories, you don't always have to be watching the TV to get the gist of the story. What I heard is that there appears to be a flaw in the design of front loading wash machines which allows mold to grow beneath the door seal. Sure enough, I made my next stop the laundry room, pulled out a folding stool stored there and took a closer look with the flashlight I grabbed on my way through the hallway. Sure enough, I could see mold growing underneath the gray seal. I'm not sure why I never looked here before to discover the source of the smell coming from the washer. Every time I stuck my head into washer to discern the source of the odor, I focused on the shiny, stainless steel drum. All this time I had overlooked the gray seal as the source of the problem. In this moment, I experienced the magic of being in the right place at the right time. In these situations, it seems like the universe suddenly provides you with what you need, be it information, a resource or the opportunity to meet someone who can help you. You definitely need to be living in the now to take advantage of these moments. But contrary to popular belief, I think that these experiences are waiting to happen more often than we are aware. I believe that every day, the universe offers us what we need to live our lives. I'm not talking about money raining down from the sky ... although there is the odd story about even this happening. What I'm talking about are the lessons and experiences that teach us how to fully live our lives. Like the Chinese Proverb says: "Give a man a fish and you feed him for a day. Teach a man to fish and you feed him for a lifetime. I guess an updated version might be this one from Marianne Williamson's Facebook page: Expect less from other people; expect more from universal supply. Either way, you need to be paying attention to see the clues that lead you to fishing lessons and universal supply. I think most of our discoveries are just moments when we happen to be paying attention to the "here and now." Which I guess makes living in the "here and now" always the "right place at the right time." Share your thoughts and stories about being in the right place at the right time by leaving a comment below. It's Autumn and my fibromyalgia exists on the edge of a potential flare-up. It took four years before it really hit me how much the changing of the seasons, from Spring and Summer to Fall and Winter, affects my functioning. While the rest of the country will probably resent me for complaining about the weather in "sunny and warm Southern California," I hope my fellow Chronic Babes and fibromites will understand. Contrary to popular belief, we do have seasons here. We don't get a lot of rain this time of year, but we do get a good dose of cooler temperatures. Our Autumn consists of warm days (in the 60's and 70's) and cold nights (in the 40's and 50's), punctuated by the occasional daytime mini-heatwave or nighttime mini-cold snap. Living close to the coast like I do, there are the occasional damp, foggy nights and mornings as well. Autumn also corresponds to fire season, especially when the dreaded Santa Ana winds start blowing hot air over the Summer-parched landscape from the Inland Empire towards the Pacific Ocean. I've discovered that it's all this bouncing up and down of the mercury in the thermometer on a daily basis that makes my symptoms worse. In the past 24 hours, the temperature in the house alone has gone from 67 to 73 and back to 67 degrees. My body right now is not happy. Apparently it likes consistency in temperature, most probably because dysautonomia makes it difficult for me to regulate my response to temperature changes. It appears that going from hot to warm is OK, but going from warm to cool is not. So paying more attention this year, I have learned that around sunset I need to start wearing a scarf around my neck to counteract the chill in the air that goes straight to my neck. It seems that my neck is a weak link in my chain of pain. This makes sense in light of the recent discovery that I have thoracic outlet syndrome in addition to fibromyalgia. If I am diligent about putting my scarf on, I can reduce the increase in neck pain I have been experiencing each evening since Fall rolled around. We are fortunate to have added central heat and air to our home about nine years ago, a convenience that wasn't originally installed in our 1949 house. We use these appliances, but try to do so sparingly and judiciously so as not to incur huge gas and electric bills. Right now it is hard to convince my husband to use the heat because it really hasn't gotten that cold yet. At least I have convinced him not to let the overnight low go much below 67. Anything colder and the air that comes through my CPAP machine makes my nose cold and uncomfortable. I guess this is a long winded way of saying that since I started living with chronic illnesses, I've become much more aware of the weather and its effects on my body. Spring and Summer are my body's favorites, Fall and Winter not so much. So if you see me out and about in a tee shirt and winter scarf, just know it is my way of staving off a potential fibro flare-up. I got a chance today to catch up with my friend Alethiah, who is a freelance writer. Like me, she is participating in NaNoWriMo, probably more successfully than I am so far. I sorta got her started on Facebook, just like my friend Cyndie got me started. As we were talking, she shared with me a silly story about a conflict that arose on Facebook, all because of the rules of a virtual game there. I have to admit that I have already forgotten the name of the game--all I can remember from her description is that it was some sort of farming game. You ask Facebook friends to be your neighbors in the game so you can unlock items in the game, buy more land and receive gifts from them. Apparently part of this game is stealing crops from your neighbors' farms. So the story begins with someone playing this game with her, let's call him Larry, sending a message to all his neighbors, including Alethiah, demanding that they stop stealing his crops. Larry's message resulted in a series of posts back and forth amongst the players. First, someone tried to explain to Larry that stealing crops was just part of the game. Larry replied, saying that neighbors could only steal crops if they were about to go to waste. Someone else responded that that was not how the game was played and if Larry wanted this player to stop stealing crops, then Larry should not be his neighbor. So Larry let everyone know he deleted this player. Then Larry got into it with another neighbor, alleging that this neighbor was stealing all of Larry's prime crops and not giving Larry the chance to do the same when he came to visit their farm. The long and the short of it is that Larry ended the discussion by informing all the neighbors he was not longer playing the game, removed them all from his Facebook friends list and accused them of being "out for just themselves" and having "bad gameplay." I know this might be cliche, but many people have referred to life as a game. In fact, some people believe that the act of playing games is a way for children to learn about life. All games have rules and sometimes, to win at a game, you need to work together with other people to achieve this goal. Some people really get their feelings hurt when they don't win, suspect that others are cheating or don't understand the rules and how to use them to their advantage. Taking this another step further, I sought a connection to my own situation. I could say that when I started playing this "game of life" I didn't know that chronic pain was going to be part of it. By all accounts, I continue to have every reason to rail at the gods, and anyone who will listen, about how unfair this is. There is a part of me that doesn't want to play the game by this new rule, chronic pain. After all, in so many ways, chronic pain interferes with my "gameplay" and holds me back from advancing like most other people can. I guess if I wanted to, I could complain, take it out on other people or try to change the rules of the game. And I guess if I didn't get what I wanted using these strategies, I could just give up, stop playing, turn my back on my "neighbors" and walk away blaming the gods, other people and the game for my problems. But here is something that I know, that Larry might not. Life is all about change. There truly are no guarantees in life, and I know from personal experience that the rules, and the game itself, can change at any time, for any reason. The secret to my success is simple: go with the flow, be flexible and embrace change. Following this simple advice is what keeps me in the game, and in the end, that's what it is all about: being in the game. I know I can't get the good stuff if I am not playing the game. So thanks Alethiah, and Larry, for reminding me of this today. It's hard to prepare and cook meals when you have fibromyaglia. Between the intense use of my hands to wash, chop and prepare ingredients and needing to stand to access the sink, refrigerator, stove and oven, I've avoided cooking in favor of quick prepare, heat and eat refrigerated and frozen meals from the grocery store for quite some time now. That is until I rediscovered the crock pot, thanks in part to the Sandra Lee series of Semi-Homemade Slow Cooker recipe books. Last night we enjoyed Tomato-Garlic Chicken, using some of the last zucchinis that are still growing in my garden. The great thing about the Semi-Homemade approach to cooking is that a lot of the prep work is eliminated when you use mostly ready-made foods from the grocery store with some fresh ingredients. A lot of the additional work in traditional crock recipes, like browning the meats and other intermediate steps, are streamlined or eliminated. Literally, all I had to do to make this meal was slice two zucchinis, open a couple of cans and jars, wash, pat dry and season some chicken and layer everything into the crock, turn it on and wait for dinner. Yum! Here is the recipe, with my own Trader Joe's twist. Let me know if you try it and like it. 1. Using a 5 quart crock pot, combine zucchinis, onions, diced tomatoes and garlic. 2. Rinse and pat dry chicken pieces. Season with salt and pepper and place into the crock pot on top of the vegetables. 3. In a bowl, combine the Picatta sauce, tomato paste and olive tapenade. Pour over the chicken. 4. Cover and cook in LOW for 4 1/2 hours. Serve over one of Traders Joe's shelf-stable 90 second microwaveable rice blends or Trader Joe's frozen microwaveable penne.